Millions say they believe in God — but WHY does He seem so FAR OFF to them? Millions have heard ABOUT God, but do not KNOW God. This article tells you HOW you CAN! Are you like the person who said to me, "Oh, I believe in God all right, but it seems like He is so far off — so UNREAL"? The instant you were born you knew nothing about God. You knew nothing — period! You were born with a mind capable of receiving, but as yet unfilled with, knowledge. Whatever you may know — or think you know — about God has come into your mind since birth. How did knowledge begin coming into your mind? There are only five channels through which knowledge may come, naturally, into the human mind — the channels of sight, sound, taste, smell, feel. But as a child, through the sense of hearing, you probably were told something about God. But understandable knowledge of God comes from the third dimension — the ABOVE. And the ABOVE is spiritual. God is a spirit. Spiritual things cannot be seen, nor heard, nor felt, nor tasted, nor smelled. Understanding of spiritual things cannot enter the human mind through the five sensual channels. Therefore it is probable that the adults trying to tell you about God did not have true perception and understanding. And it is natural that whatever knowledge about God entered your mind — through the ear, or the eye — was vague, misty, UNREAL. You couldn't SEE God. Spirit is invisible to human eyes (except, as has happened, by some miraculous "materializing" or means of manifestation). You couldn't hear God. You had no actual conscious contact with Him. You probably formed some imaginary picture in your mind of what you supposed He must be like — based on what might have been told you, or what you may have read. But you didn't SEE or HEAR Him — you read or heard only something ABOUT Him! And the picture was unclear, clouded, out of focus, ethereal. The very presence of the around seems to the normal mind to demand a "first cause" to have produced it. Yet — MYSTERY of MYSTERIES! The "first cause" is not seen, heard, smelled, tasted or felt. So many ideas, concepts and conjectures have been brought forth out of human imagination as to the nature of that "first cause." "Because what may be KNOWN OF GOD is manifest in them, for God has shown it to them. For since the creation of the world His invisible attributes are clearly seen, being understood by the things that are made, even His eternal power and Godhead, so that they are without excuse"(Romans 1:19-20). The verse preceding the above says the world's leaders have known the truth, but have held it back from the people — prevented them from receiving a clear understanding: "But God's anger is revealed from heaven against all the impiety and wickedness of those who hinder [hold back] the Truth by their wickedness" (Romans 1:18, Moffatt). 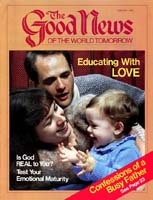 So what is usually told to a growing child about God usually is a very distorted picture, indeed! There was super-righteous Job, the greatest man in all the East. God even challenged Satan, the accuser of God's people, to find a single sinful or unrighteous flaw in his character. Even though allowed to put Job through the most painful and severe trials, Satan could find nothing against him. Of course there was something very unrighteous about Job. All have sinned — including Job. His great sin was his very SELF-righteousness. Satan could not recognize SELF-righteousness as a sin. But after God whittled Job down to size, humbled him, made him see his own insignificance and vanity — his nothingness compared to the great God — Job said: "I have heard of You by the hearing of the ear, but now my eye sees You. Therefore I ABHOR MYSELF, and repent in dust and ashes" (Job 42:5-6). Not from the ABOVE — but from the AROUND! Not from God Himself, but from the AROUND. And your Bible says the other people constitute a deceived world! He probably is just as I was for many, many years: I did read the Bible at times — but I then said, "I just can't understand the Bible." There is a way in which YOU can establish actual, direct, personal contact with God — if you have not done so already. Then He will become REAL! Let me give you an illustration. Let's say you have heard about Raymond F. McNair. He is Deputy Chancellor of Ambassador College in Pasadena. You may have read one or two of his articles in The Good News or The Plain Truth. But let us suppose you have never seen his picture — you have never seen him in person, you have never talked with him. Suppose someone has told you a few things about him, twisting the facts and giving you untrue information. You may know a few things about him — and some of those distorted — but you surely could not say that you know him. If you have not even seen his picture you don't know what he looks like. Many people, having heard me on the radio, said on seeing me in person, "Why, you don't look a bit like I pictured you in my mind." In the same way, if you should come into personal contact with Mr. McNair, you'd probably be surprised to see that he wouldn't look at all like you pictured him. But, if you were suddenly thrown in his company almost constantly, seeing him virtually every day, talking with him, seeing him in his office and in his home, you'd get to know him! I know him well. I have known him ever since he came to the front door of my home in Pasadena nearly 37 years ago. Three days later he entered Ambassador College as a student. In four years he graduated. He continued his studies, doing graduate work, earning his master's degree. I see him fairly often. I spend a good deal of time talking with Mr. McNair about college problems, about student and manpower problems, about personal interests. I have gotten to know him! I can tell you that I know God — and that I also know the living Jesus Christ — for I represent Him as His servant. I read about Him — not as other people MISdescribe Him — but as He describes Himself in HIS BIBLE! But, I said a while ago that 59 years ago I "just couldn't understand the Bible." NO ONE CAN, really, until they have gained contact with God (the Father) through Jesus Christ, and have received His Holy Spirit, begetting them as His begotten children. That requires the same kind of REPENTANCE Job was put through — a genuine abhorring of the self, an unconditional SURRENDER to OBEY Him and His law and a real faith in Jesus Christ as personal Savior. His Spirit opened my mind to SPIRITUAL COMPREHENSION. I could UNDERSTAND THE BIBLE — a bit at a time, of course. In it, the living Jesus Christ began talking to me. I began to talk to Him — often, daily, in a sense constantly, in spirit. When I studied the Bible, it was like listening to the most wonderful Friend I had ever known! It was WONDERFUL! It was INTERESTING — INSPIRING — REVEALING! So I studied the Bible often on my knees. You see, as I read the Bible, God was talking to me. But as I prayed, I was talking to HIM! And by studying His Word on my knees, I was able to carry on a two-way conversation with Him — mixing prayer with listening to Him through reading His words. It was invigorating, rejuvenating beyond words to describe. He was TEACHING ME. I was gaining NEW KNOWLEDGE — spiritual knowledge — knowledge to LIVE BY — knowledge to put into action — instruction to be acted on — commands to OBEY by doing! He was no longer WAY OFF! He was very NEAR — in spirit, in the very same room. I have never seen God or Jesus Christ PHYSICALLY — with my physical eye — but I see them often, spiritually, in my mind. Not precise definite features, of course — but I see in my mind's eye eyes flashing out like a flame of fire — His face shining as brightly as the sun in full strength — His head and hair white as the cleanest, whitest snow. And all around where He is sitting is gleaming, glistening, beautiful SPLENDOR and brightness, with lightning flashing forth. Perhaps I don't see this as distinctly as I expect to after I enter His Kingdom as an inheritor, BORN of His Spirit in SPIRIT COMPOSITION — no longer a mortal human composed of flesh and blood. Because you have to REPENT — and that is NOT EASY. To just say the words "I abhor myself" does not mean you really do. To really CONFESS that you have been WRONG — that you are NOT good — that there is nothing good IN YOU — that you not only have DONE wrong and sinned but that you ARE wrong and sinful — that is not easy. The SELF has to DIE — and your human nature will fight that to the death. To make an UNCONDITIONAL SURRENDER to God and HIS LAW — His authority over you — His commandments — HIS teaching — HIS WAY of living that is so UTTERLY CONTRARY to the way your friends and associates are living — that is NOT EASY. SELF within you will shout out: "But what would my friends — all my associates — those I have been close to — what would THEY think?" You'll have to be willing to GIVE THEM UP — for they probably will throw you over — IF you surrender to God, let Him turn your life right side up, live a totally changed life according to His teaching! Are you too big a coward to do it? You have to be WILLING to GIVE UP — everything! — for HIM. Do you want HIM that much? Do you want the happiness of a REAL Christian LIFE that much? Do you want ETERNAL LIFE in His Kingdom that much? Few do! That's why God is not REAL to most. There are the THREE DIMENSIONS. Most people have consciousness of only the first TWO! They seek pleasures, happiness, in the AROUND — things, people — this world! There are some temporary thrills, delights, pleasures. Sure! But they NEVER LAST! And you pay too big a price for them. They're a bad bargain. You may look to the within — but it's like looking down into a well that's gone DRY. There's nothing there to quench that inner thirst. You CAN contact the ABOVE! IF you're willing to pay the PRICE, that is. It isn't easy. But it's the ONLY dimension that SATISFIES — that fills that inner void — that feeds that gnawing soul of HUNGER — that expands your horizons — that opens your MIND to the glories of SPIRITUAL COMPREHENSION — of understanding SPIRITUAL KNOWLEDGE — of really UNDERSTANDING the Bible, in a way that produces happiness brimful and running over! There are TWO directions you can go in life. Most people go the direction of SELF — vanity! It's the way of self-centeredness. Everything is coming INWARD. Toward SELF. Getting! Taking! Acquiring! And you keep shrinking smaller and smaller. The other direction is the way of God's LOVE. Love fulfills His law. LOVE is outgoing concern! It is, first of all, GOD-centeredness. It is LOVE to God, in worship, adoration, faith, obedience. It is, second, LOVE to fellowman — loving others AS yourself. That's a lot of love. That is the WAY of the ABOVE. That way constantly EXPANDS your horizons. That way you GROW — and GROW — and GROW! You DEVELOP! You develop GOD'S CHARACTER! You GROW in love — in happiness — in abundant well-being! LIFE becomes abundant and JOYFUL! I know! I have known 59 years. Life has had its problems, persecutions, disappointments — but it's been RICH, FULL, REWARDING, ABUNDANT!